Pinky wants to try out for the school play. Rex, on the other hand, is terrified of appearing on stage. But when Pinky talks Rex into going with him to the auditions, guess who ends up getting the lead part that Pinky wanted for himself? Rex is so good, the teacher changes the name of the play so that she can play the lead role. And Pinky has been cast as one of the monkeys! It's no wonder that Pinky is sad and angry. Will Pinky and Rex still be best friends when the show is over? 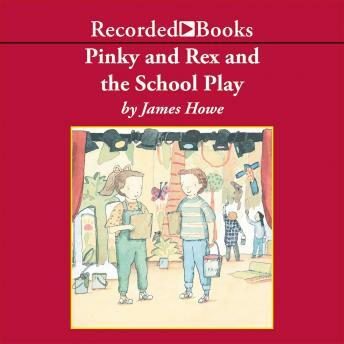 Of the many popular books for young readers that James Howe has written, the Pinky and Rex books are some of the most endearing. Beginning readers love the friendship and fun found in each of Pinky and Rex's adventures. Narrator Christina Moore captures the gentle warmth of the stories, and makes their appealing characters even more real.